You'll love the location of the Chalet Hotel Rosanna, just off the pedestrianised main street in the heart of St Anton village, which is famous for its night life. The hotel is only a five minute walk from the ski schools and main lifts which give you access to arguably the best skiing in the Austrian Tirol. If you looking for some fantastic skiing and serious après ski, then St Anton is the perfect ski resort for you. Inside this traditional style chalet hotel you'll find plenty of charm, with ornately carved ceilings, rich fabrics, comfy sofas and rustic wooden furniture. Chalet Hotel Rosanna is for adults only outside of the school holidays and the lounge is an extremely popular meeting place for our hotel guests at the end of the day. Step out into the main street and sample the village night life or you can always opt for our very own Scotty's bar right next door to the hotel which has a lively, fun atmosphere and, incidentally, serves delicious pizzas too. Breakfast, tea and dinner are all served in the spacious dining room, which has plenty of charm of its own. The large tables are perfect for a sociable evening, catching up on the day's skiing over the delicious three course dinner which is accompanied by a choice of complimentary wines. The day starts with a hearty English breakfast or an appetising continental option with fresh pastries. And we make sure there's plenty of home baked cakes and warming soup available at tea! Please Note: One evening a week dinner is not served in the chalet hotel allowing you the opportunity to dine out at one of the excellent local restaurants. We update Chalet Hotel Rosanna's details often, but facilities do change. e.g. some extras listed by the supplier as "free" or included might only be for the first time you use them, or for one time per party, then charged for further use. If any specific feature is essential to your holiday, make sure you ask us to confirm the details of it before you book your holiday. This package holiday to Chalet Hotel Rosanna in St Anton, Austria departs Sunday 5th January 2020, for a 7 night stay on a "catered chalet" board basis. A local tourist tax (Taxe de Sejour or Kurtaxe) is levied by many councils in European ski resorts. It varies by standard and type of accommodation and is age dependent, so not everyone is charged. It's not included in the basic price of your holiday and is usually paid locally. For reference, the average charged in winter 15/16 was between 50p and £2 per person, per night. St Anton lift pass price last reported as €228 (adult 6 day). Ask for a quote when booking Chalet Hotel Rosanna. Haus Hochkar St Anton Austria, Gatwick to Friedrichshafen 5th January. VIP CLUB Fritz St Anton Austria, Gatwick to Friedrichshafen 5th January. "Lovely holiday! Great food and right in the middle of town"
We stayed here at the beginning of April 2014 as a couple. I was really impressed by the whole experience, especially how well the Rosanna is run. In particular the food was excellent. We had really tasty and filling 3 course meals every evening. The chef made a real effort with the presentation as well - it was equivalent to eating in a decent restaurant or a gastro pub. To give you an idea, we ate things like goat cheese and roasted pepper salad, shoulder of lamb and panna cotta. There were at least 3 choices for starters and mains, and veggies are well catered for. I was not expecting such good food for the price we paid. My boyfriend (who is a bit of a fussy one) didn't touch the wine, but I quite happily drank the rose (can't complain when it's complimentary and free flowing!). He was also ill while we were there and the staff really went out of their way to accommodate him and make him feel as comfortable as possible - to the point where they offered to bring him food to his room. Our room was probably the nicest thing about the hotel, it was very comfortable. The rest of the hotel is fine but it could do with a face lift to be honest. Our bathroom was clean, modern and well finished and we had a bath which is always nice when you've been skiing all day. There’s complimentary shower gel and shampoo, and you even get a little bottle of hair conditioner. The beds were comfy and large. Make sure you request for a room away from the bar area as some of the rooms are above the bar and apparently they are quite noisy. We had to fork out about 10 euros for internet which was annoying but apparently some of the other guests didn’t even get Wifi reception in their rooms. That seemed to be the only grumble that everyone at the hotel had. The staff really were exceptionally friendly and helpful. I noticed they were good with the children that were staying in the hotel, and the children all seemed to be making friends and playing board games in the lounge together. There was generally a very friendly and communal vibe at the hotel. At dinner we were seated at large tables together with other guests (the seating plan changed each night), so we gradually got to know most of the other people staying at the hotel. The hosts also encouraged us to ski together by organising a meeting point for lunch. It’s definitely a good place to come as a solo traveller. The location is spot on, literally right in the middle of town. It's only a few meters to walk to several of the main lifts. You can easily get to the Galzig ski area (which we particularly liked) by walking a few minutes to the Galzigbahn, or if the snow isn’t as good (we went in April which is late in the season) then go up high on the Rendl side which is northerly facing so the snow stays good for longer, and again the Rendl gondola is literally just down the road from the hotel. The ski hire shop was only a few meters away, and the main pedestrian high street is just round the back of the hotel. We booked our own flights to Zurich and then took the train from the airport (there's a direct train to St. Anton from Zurich HB). The Rosanna is literally opposite the train station, so it was really nice that I didn't have to lug my baggage around town. It was also in the perfect position for après ski - downstairs is Scotty's bar where all the seasonaire types seem to hang out. The famous Krazy Kanguruh and Mooserwirt bars are up on the slopes not far away. There's also the Bodega tapas bar round the corner which we went to with some friends. We didn't eat here but our friends did and I had serious food envy! "Great week at the Rosanna"
The Rosanna was great and we had a great time. We were on the top floor and had a big room, but my friend booked a twin room for 3 and it was tiny. She ended up paying for another room when she was there as there was a spare room available. The bathrooms seemed newish and my friend who had been there before said it looked new. A huge plus was the hot baths that I had at the end of every day! It was amazing! The location was absolutely perfect!! Everything was right there and the ski lift was about a 5min walk. The location was definitely a big plus! The food was good, the breakfasts were great, however the dinners were up and down. The one night we had a lemon risotto and it tasted like feet. The cakes were hilarious and were made of lovely colours… The one I remember most was bright pink and fluffy. The one thing I wish they would sort out is the TV’s. I don’t necessarily watch a lot of TV, but it was like from the 1980’s; a big ugly box TV. It would have been really nice to have a flatscreen in the bedroom, even just a cheap flatscreen TV, just to make the room feel a lot better. It was fairly average accommodation, pretty much what I expected, it was as it said it was on the tin basically. "Rooms really good. Had a great time." Had a great time here! The rooms were good, I slept in a twin which was spacious and had a really nice bathroom. The food was ok, better on some days than others but otherwise fine. It has a good location near the lifts which took about 5 minutes at most to get to via an easy walk just up a road. It’s really near the main high street where all the famous bars are, so it would be a good for younger people too. "Very convenient location and very helpful staff"
It was fine, a bit run down but otherwise good. 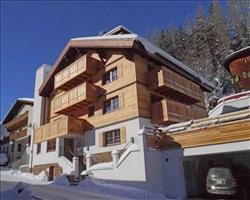 It’s in a very convenient location, about 5 minutes’ walk to the nearest lift, ideal really. It’s also right next to the train station. All the bars and restaurants and things are nearby. There’s a tapas place and a nice café with good pastries a few minutes’ walk away. The staff were very helpful and very friendly. The food was surprisingly good. The ice cream was nice and it was nice to come back to afternoon tea with cake, etc. There was a good selection of options at afternoon tea. The room was ok, nothing special. It was facing the station and quite quiet. I was generally very impressed with the chalet. "OK, food could be better"
The actual chalet hotel was OK. I’ve stayed in Austria several times before, where hotels are run by Austrians, but this place as run by English and the food wasn’t brilliant to be honest. The staff were very friendly and the whole place was clean, it was just the standard of the food. You’re a fifteen minute walk from the ski lift. There’s a ski room at the back of the hotel, so you’re walking with ski boots and equipment which isn’t ideal. "Superb location, great food and very friendly"
I love the Rosanna because its so central and the hosts are so enthusiastic and knowledgable about how to get the most from a week in Austria's greatest ski town! I think it filters down from the top because Adam the hotel manager is a true Brit-gone-native... having first visited as a seasonaire and then stayed for more years than he should admit to! You get the best of both world's with this chalet-hotel; the extra catering of a chalet (afternoon tea/cakes plus the all-important free wine with supper) but also the higher standards of chef-ing and extra communal/socialising spaces that come with accommodation the size of a hotel. 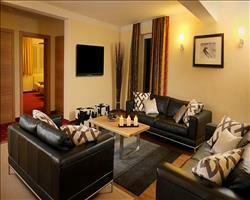 The rooms are of a higher than average standard but not quite boutique hotel. The hotel-run bar in the basement is great when you're too tired to head off into St Anton after dinner, but to be honest its all so central you're likely to make the most of perhaps the world's most famous après ski. For the best lunch up on the mountain, go to the ultra-glam Hospiz Alm and eat inside, where you'll see photos of the great and the good who ski and eat there including Micheal Schumacher, Tony Blair, Pres Putin and dozens of others - make sure you take the old stone slide down to the basement loos - hilarious after too much gluhwein! More of an adults hotel >> fine with teenage kids in tow, but consider somewhere like the Schweizerhof for younger family ski holidays.